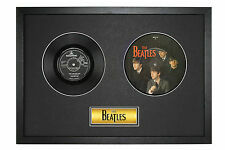 THE BEATLES PLEASE PLEASE ME /ASK ME WHY 20th ANNIVERSARY ISSUE PICTURE DISC ! THE BEATLES TICKET TO RIDE RARE SEALED USA LONGBOX CD! This page was last updated: 23-Apr 21:51. Number of bids and bid amounts may be slightly out of date. See each listing for international postage options and costs.